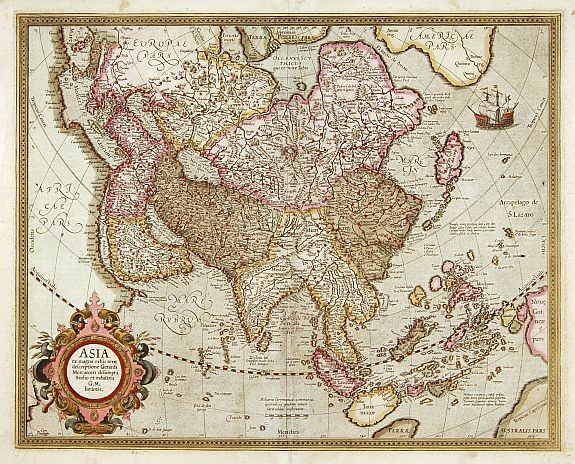 MERCATOR - Asia ex magna Orbis terre descriptione Gerardi Mercatoris..
MERCATOR, G./ HONDIUS, J. - Asia ex magna Orbis terre descriptione Gerardi Mercatoris..
Asia ex magna Orbis terre descriptione Gerardi Mercatoris.. - MERCATOR, G./ HONDIUS, J. Size : 14.8 x 18.2 inches. / 37.5 x 46.3 cm. The coasts of North East Asia and North West America are separated by Gastaldi's fabled Straits of Anian, where a well-placed galleon provides speculation as to the possibilities of an Arctic route to the Indies.. Condition : In attractive colours. Printed on heavy paper.